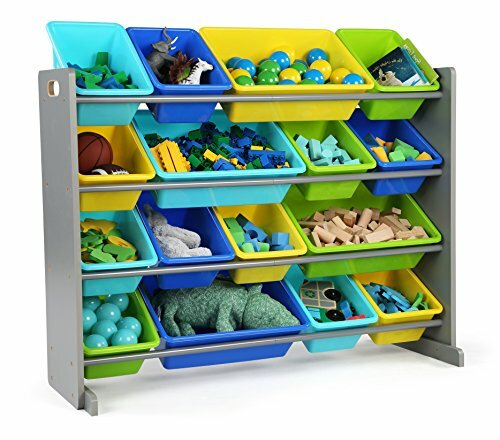 The space-saving Tot Tutors elements Extra Large toy storage organizer with 16 plastic Green, yellow, light blue, and blue colorful bins is ideal for organizing your child’s bedroom, playroom, nursery, or the living room. The 12 regular-sized and 4 double-sized easy access storage containers are removable, making it fun for boys and girls to take out toys, books, and games for playtime and quick to clean up after. Our Extra Large sized Organizers help keep your little one’s room clean while at the same time the bins can teach color identification as well as sorting and cognitive skills. This toy box storage alternative is easy to assemble and the sturdy plastic bins are great for helping children sort toys. Construction on this engineered wood toy storage organizer and plastic bins offers solid support and long-lasting durability. The Height of this Tot Tutors elements collection Extra Large toy storage organizer with 16 plastic bins is just right for toddlers and preschool-aged children. This piece of furniture is a great fit for all homes, whether large or small. This toy storage organizer comes in multiple color options to complement the existing furniture in your home as well as the other kids furniture in Tot Tutors’ line of products. Durable and easy to clean. Easy to assemble.